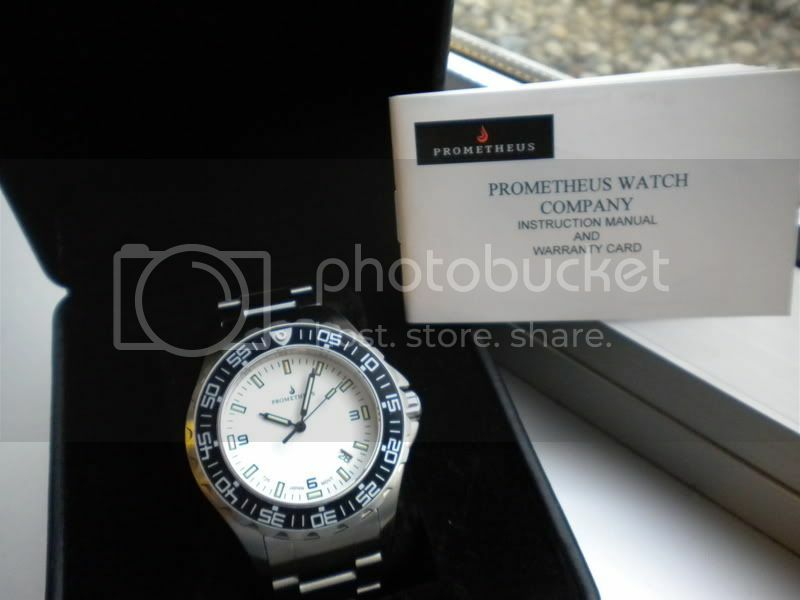 Prometheus History: The Prometheus Watch Company is based in Portugal and was founded by Carlos Carvalho in 2008. Mr. Carvalho is currently the Managing Director of the Prometheus Watch Company. The Prometheus Watch Companyâ€™s initial watch models were a collaboration between Mr. Carvalho and the watch forum community. According to my research Mr. Carvalho intends for the watch community to be an important asset for the designs of his creations going forward and will be relying on the watch forum communities for input. First Impression: The JellyFish is a well constructed timepiece at a very reasonable value with all the bells and whistles for a watch in its class. 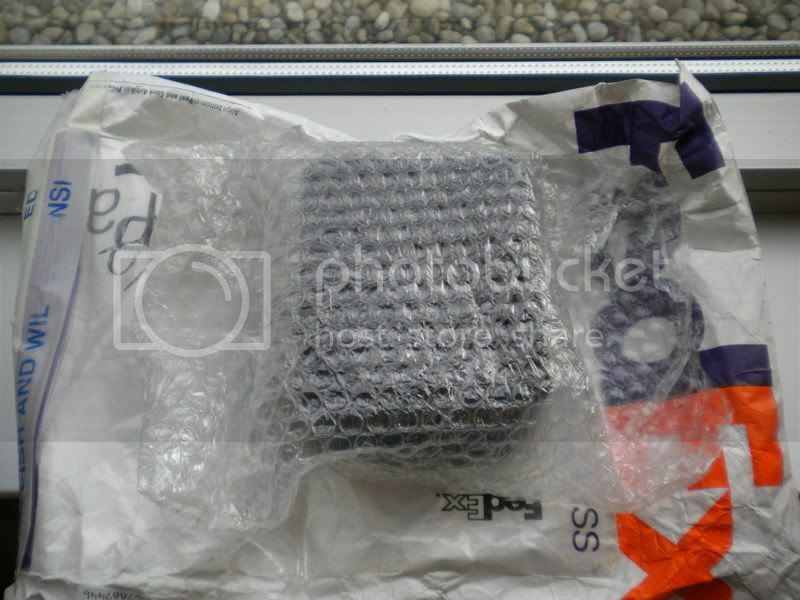 The Packaging and Watch Box: The JellyFish came packaged in a very nice leatherette box along with instruction booklet/warranty card information. No other materials were included in the packaging. 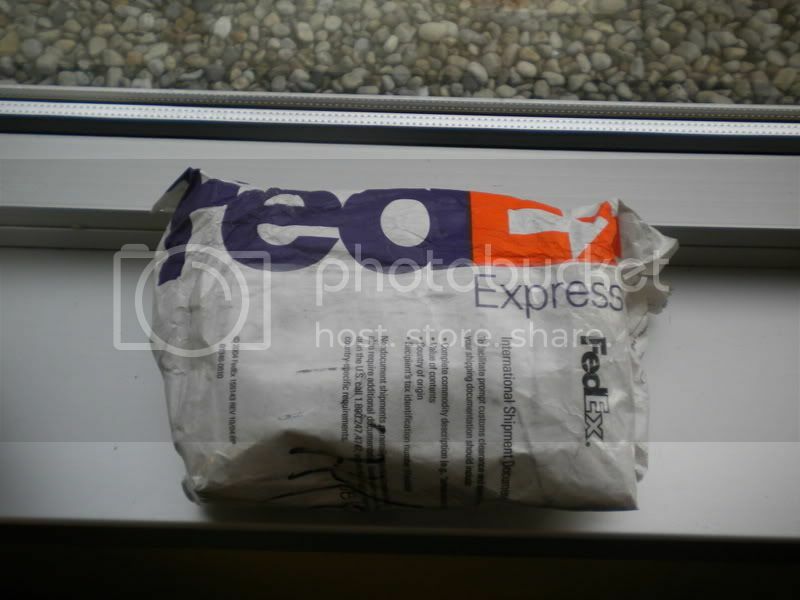 Attention was given to assure safe and secure packaging by using bubble wrap and expedited FedEx shipping. The JellyFish was received in one business day. Reviewer is unsure if this type of expedited shipping and handling is available through normal purchase or if extra charges apply. Please contact Prometheus directly regarding shipping and handling. Case - crown side: The JellyFish is brushed throughout. The JellyFish is a three hand auto which has one signed crown at the 3 o'clock position and no pushers. The crown is a screw down variety. Crown is very firm and has no play when screwing outward and inward. Signed crown is nice touch. Case - non crown side: Nothing of note. Brushed finish. Very clean appearance. 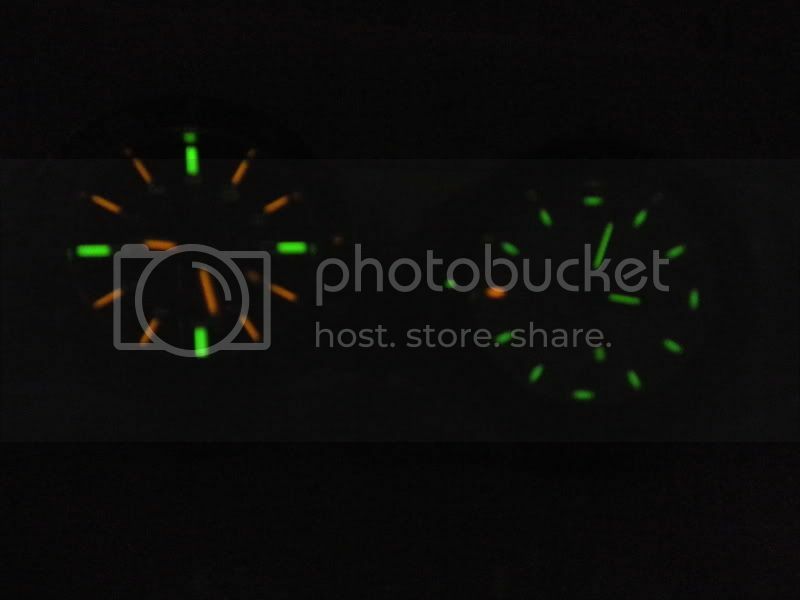 Bezel, Dial, Hands: Beginning with the bezel the JellyFish has a unidirectional90 click rotating bezel and contains tritium at the lume pip. 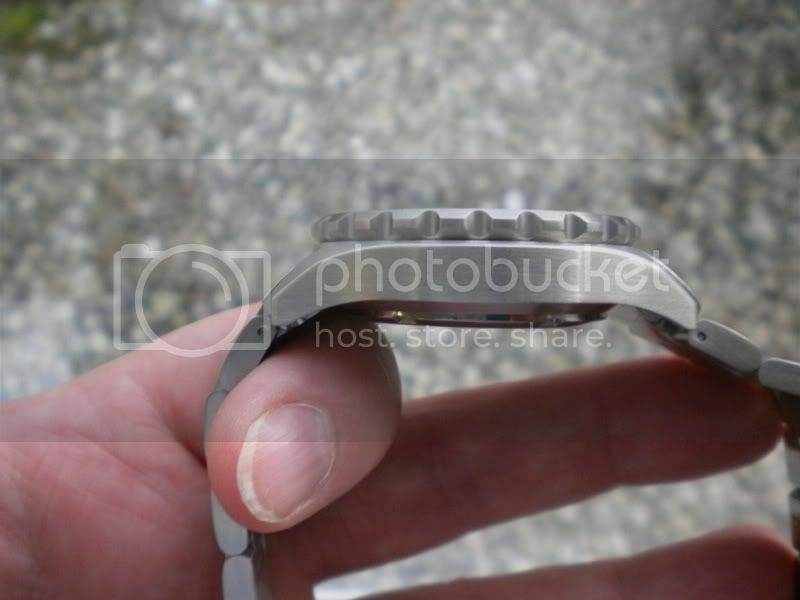 The bezel insert is black and is clearly marked 5 to 55 in silver. Next, the dial on this particular model is a snow white and contains 12 tritium tubes as the hour markers sitting below a 3.5mm thick sapphire crystal. 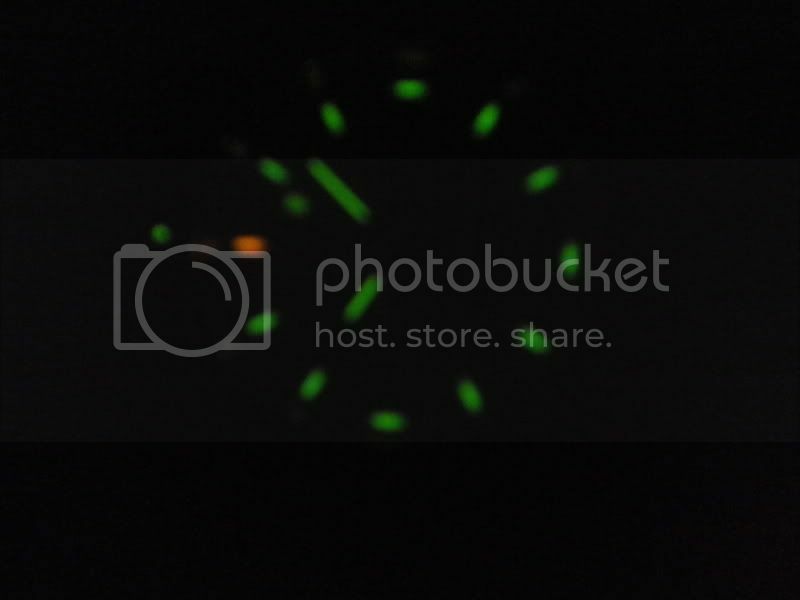 Green tritium tubes are at every hour marker except the 12 oâ€™clock which is done in orange tritium. The dial also contains the company name with logo toward the 12 o'clock position along with hour markers 3, 6 and 9. The date window sits at the 4 o'clock position and is clearly legible in white with black numerals. The JellyFish is a three hand model. Each hand contains a tritium tube. Hands are in black which show up very nicely on the white dial background. All tritium is classified as Microtec H3 T25 with T25 clearly marked on the dial. Japan Movement is also clearly marked on the dial surrounding the 6 o'clock position. Prometheus has delivered well in each of these areas. The bezel is firm with no play. The dial is extremely clean and uncluttered. No issues with the style of hands used either as they are very legible. 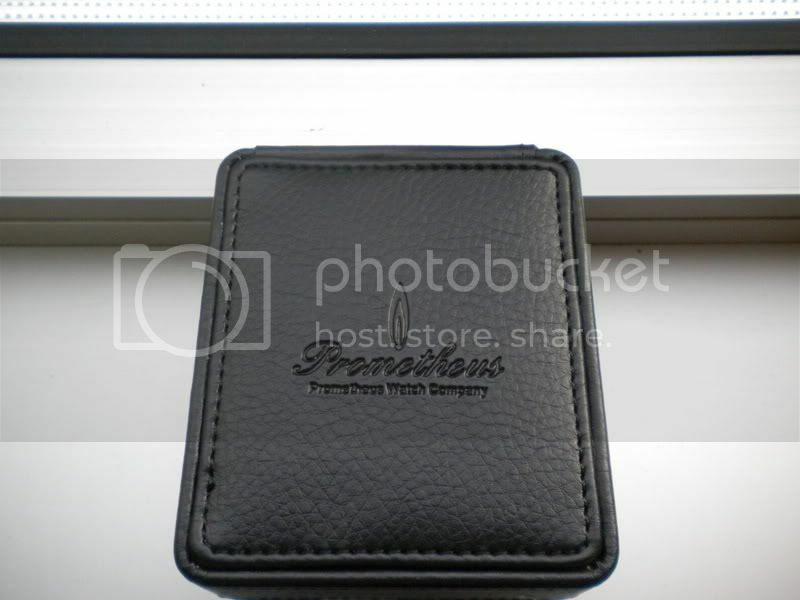 Case Back: The case back is 316L stainless steel and contains the name of the company (Prometheus Watch Co.), the JellyFish logo, water resistant rating of 300m, Japan movement, Microtec labeling and serial number. 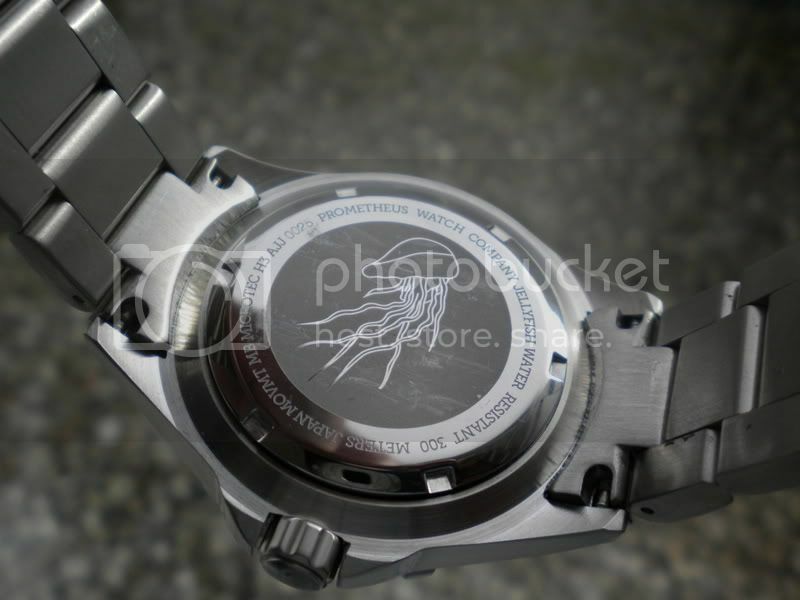 The engraving of the JellyFish sits center of the caseback and is very nicely done. Nice dive watch case back rather than an exhibition back even though the watch is reported to have a decorated rotor. 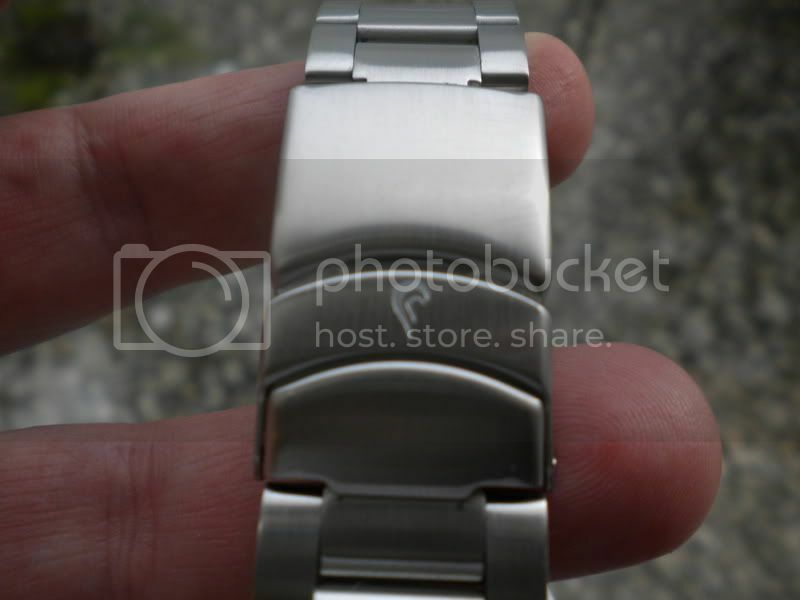 Strap or Bracelet /Clasp or Buckle: The bracelet for the JellyFish is 316L stainless steel bracelet with screw links rather than pressure pins. The clasp is a diver's flip lock with safety and the flip lock is signed with the Prometheus logo. 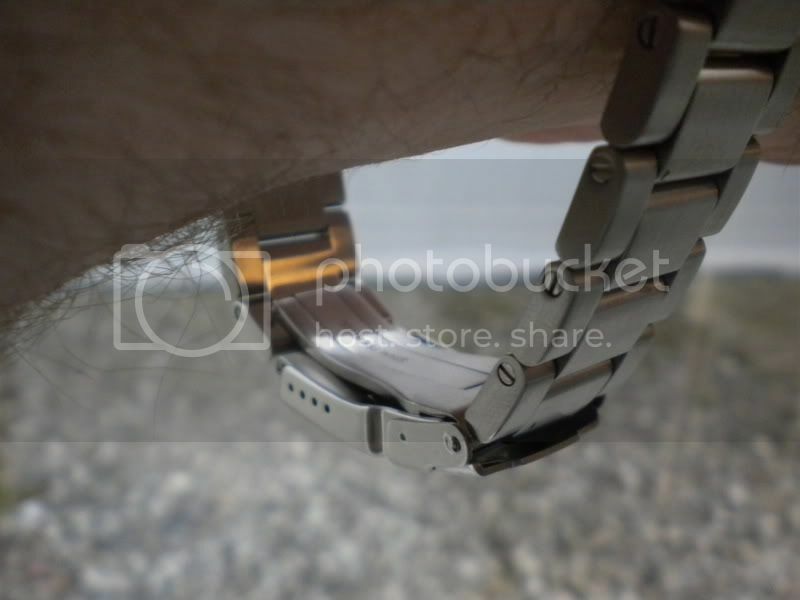 The clasp is also scissor style and contains a diver's extension. There are 4 micro adjustments on the clasp. The bracelet will fit up to approximately an 8 Â½ to 9 inch wrist. 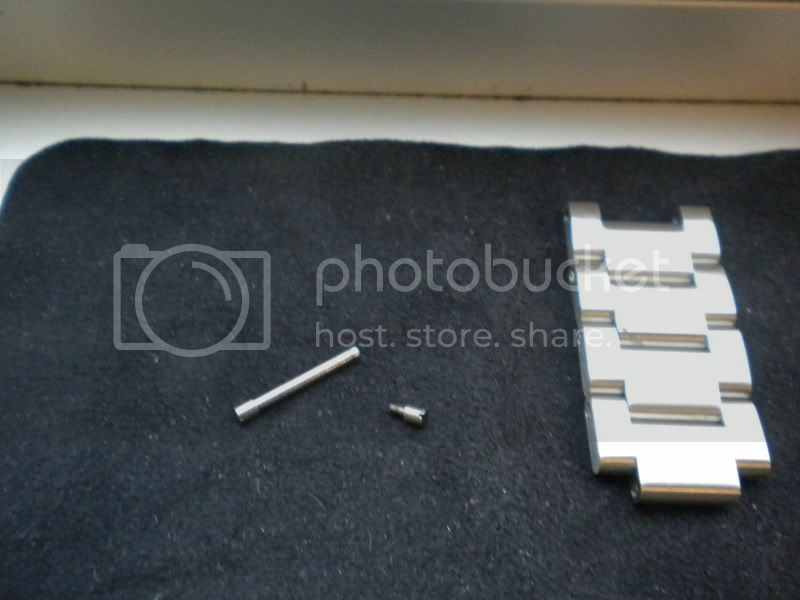 I have a 7 1/2 inch wrist and removed 4 total links totaling approximately 1 to 1 1/2 inches for sizing. 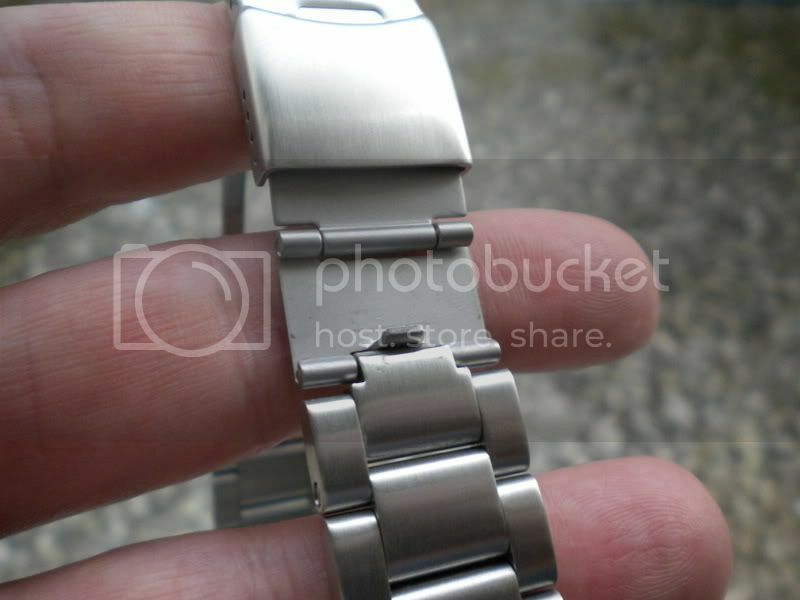 The stainless steel links are approximately 4mm in thickness. 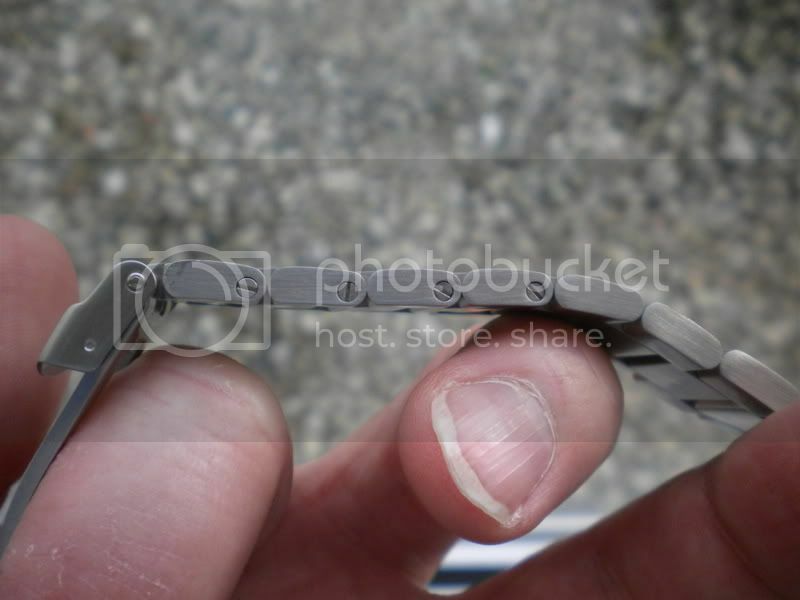 The bracelet is 22mm at the lugs tapering off to approximately 20mm near the clasp. Watch Weight: 7.8oz/221.13 grams/.488 pounds. The JellyFish has a very nice and comfortable weight for ones wrist. Movement: The JellyFish contains what many believe to be a very highly reliable automatic movement in the NE15ASeiko 6R15 movement. I do not have the capability to measure the accuracy of the JellyFish but will comment and update this review at a later date with how the movement appears to be functioning. The name of the JellyFish, through my discussions with Mr. Carvalho, was not a result of chance. The JellyFish is a sea animal that can have bioluminescence properties being able to respond to light stimulus and in some subspecies even emit their own light thus analogous to the tritium tubes contained by the JellyFish. The JellyFish timepiece origins and naming relate to exactly what niche this timepiece is supposed to fill and that is the dive watch category. I find it very nice for a timepiece to have a story behind its development rather than just a haphazard approach to producing a timepiece just to produce one. The JellyFish is a collection of 4 colors where 75 watches have been produced on each set. It is not a limited series but will not be easy for people to find others wearing one as numbers produced are low which is also a very nice aspect of this timepiece. The JellyFish comes with the choice of black, white, blue and yellow dials. While all dial colors are very nice I find that the extremely clean white dial suites my purposes better than any of the other color choices available, however at some point a black or blue dial would also be a nice addition. The JellyFish is a well constructed timepiece at a very reasonable value with all the bells and whistles for a watch in its class. I have found similarities to the Luminox and Deep Blue brands as there are many watches from these companies that I would consider comparable including my personal Deep Blue T100 and previously released T25. 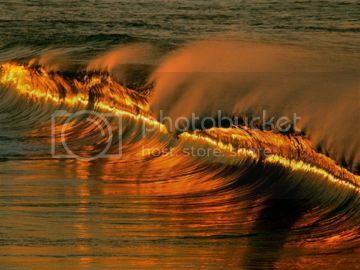 With that being said the Prometheus JellyFish is in good company with those of its â€œkindâ€�. The entire timepiece is constructed of 316L stainless steel which provides a sturdy but comfortable dive watch sitting on the wrist at around half a pound or 221 grams with all links attached. The bracelet has all the properties necessary in a dive watch with a diverâ€™s flip lock and safety clasp including a diverâ€™s extension. Screw down crown, 300m water resistant with a 3.5mm Sapphire crystal enough said. Solid Japanese automatic movement is a plus. 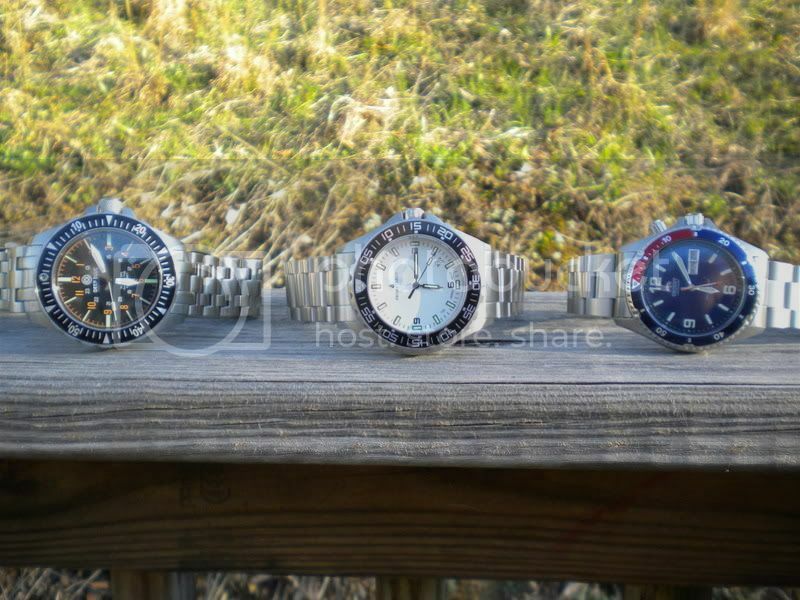 I would love to see something in a Swiss automatic as well in this line. The dial color and layout in my opinion is extremely clean and uncluttered regardless of dial color choice and is one thing I always look for in a timepiece. 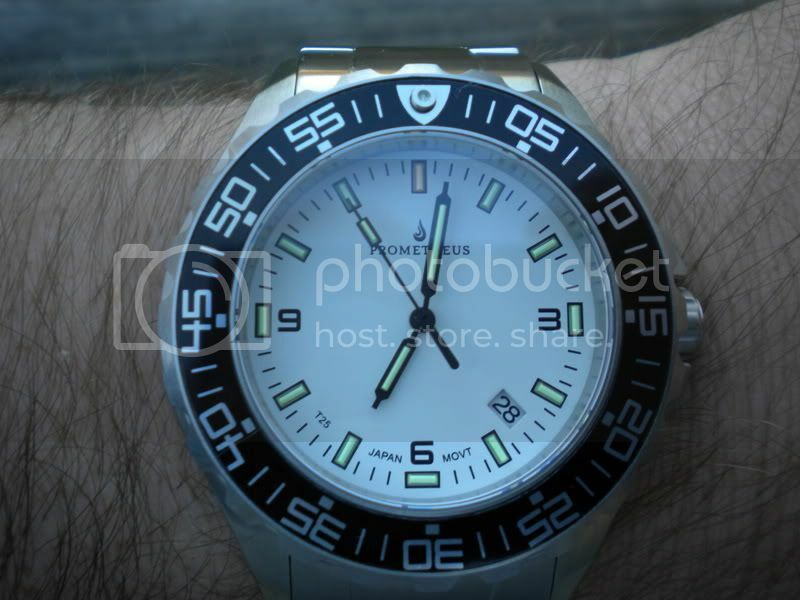 The tritium tubes rather than superluminova in my opinion are just a plus as I prefer them. While the tubes in the JellyFish are not near as substantial as the T100 tubes in my Deep Blue T100 you can see from the picture provided that they are more than adequate and I have little preference to either as both perform their function well. I find the hands to be of nice shape and size adding to the presentation of the clean uncluttered dial. The brand and certain specifications printed on the dial of the watch are subtle and once again add to the clean uncluttered presentation. Great review and makes me want this watch more. I like the new review format. Very organized and consise. Love the review format, and the review was great. Great Pics Mike, and the watch looks great. One to possibly add to my list for sure. Love the white dial, looking forward to the vidoe review! Very thorough review. Nice looking watch and a Swiss auto would make it better but the Seiko is reliable too. Thanks. Great review.....very nice looking watch too...and pretty darn nice for the price!!! Love the T25 tubes for lume....very impressive!!!! 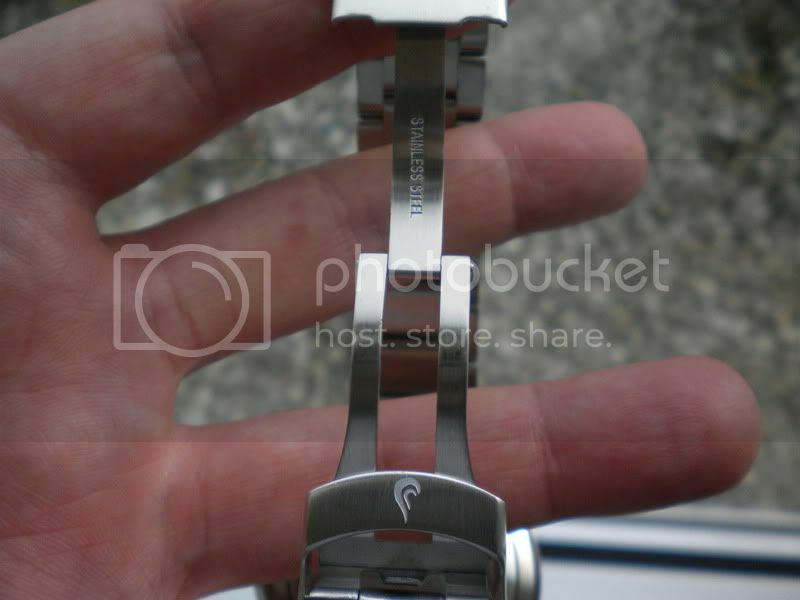 Nice review, the watch looks much nicer in your photos then the ones at the company website. Still too boring for me though. Amazing review! Exceptional details on the product with history, wonderful pictures. Send it to Oceanic Time, Mike. Maybe they can use this excellent review there. Thanks for all the intel on this very cool piece, too. 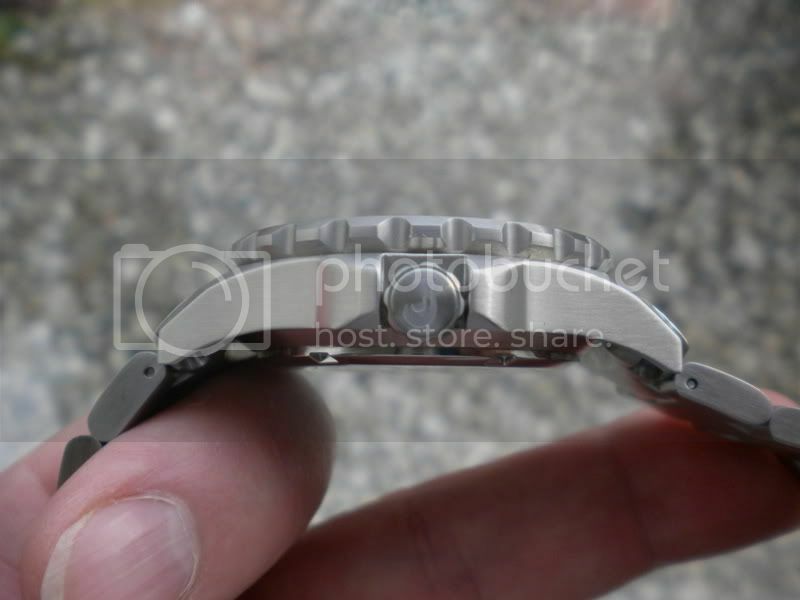 Does anyone have experience with this Seiko 6R15 movement (if I remember it right)? Movements that start with NE are considered in one of Seiko's higher categories, aren't they? First of all hello everyone. I am Carlos Carvalho, owner of Prometheus Watch Company. 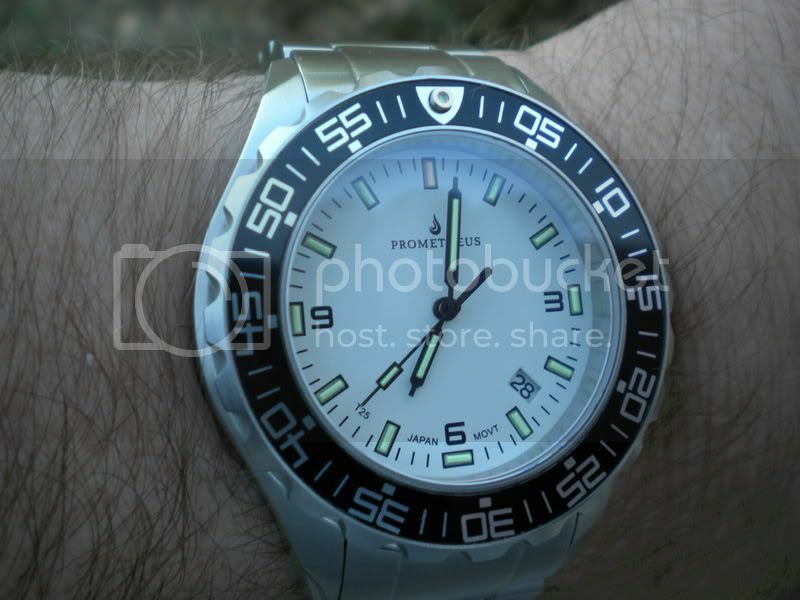 Glad to hear the Prometheus Jellyfish tritium men's watch diver is gathering interest. As for info on movement used I can confirm it to be one of the premium series and therefore the cÃ´tes de genÃ¨ve finish. Seiko sells their movements to third parties via a separate company called Time Module and based in Hong Kong. Time Module operates as a sales branch of Seiko Instruments Inc. on a very similar way as Miyota does with Citizen. This is a very durable movement with hacking seconds hand, auto and manual wind complimented with a power reserve of 50 hours. The NE15A beats at 21600 vibrations per hour has 23 jewels and is made in Japan by Seiko Instruments Inc. aka SII. Hope I managed to provide some additional info on the NE15A. is it just me or has this review disappeared? Nope not just you. There is a technical error and we are currently working on it. We are not quite sure what has happened. Stand by and thanks for the heads up. Hello Carlos. Welcome to Watch Freeks and thank you for the additional information! Many thanks and you guys feel free to ask any questions you may have. 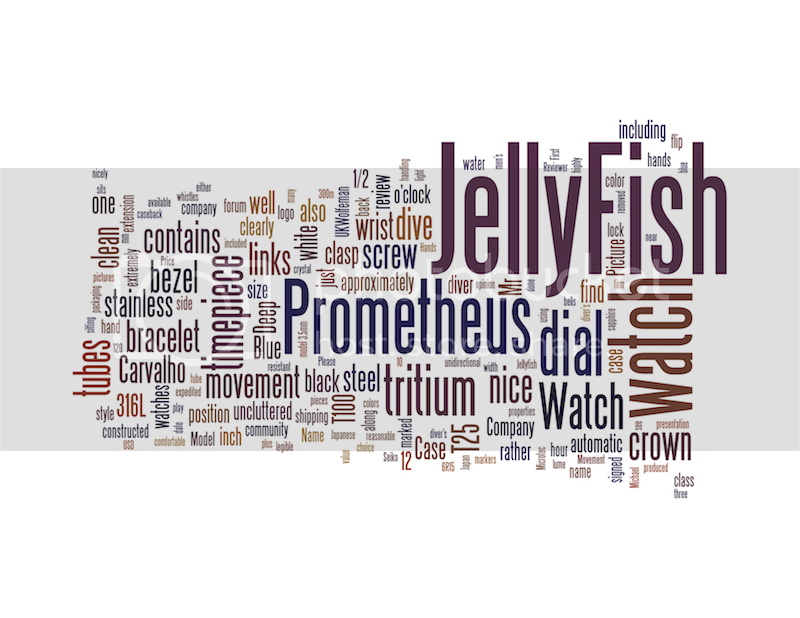 decided to play around and made a wordle out of Prometheus Jellyfish review. Let me know what you think. This would make a great model for a Watch Freeks member only piece..in my opinion. A veteran is someone who, at one point in his life, wrote a blank check made payable to The United States of America for an amount of up to and including my life. is this a hacking second hand?